MFZ135 has been sold out, we have MFZ155/MFZ175/MFZ195 available in stock, call us for details. MFZ-series - for working widths from 135cm/53inch to 195cm/76inch. Flail mower for small and medium tractors with 25hp to 65hp with CAT I. 3-point hitch. Nova MFZ heavy duty flail mower with 1500gr/3.3lbs flail hammers for branches with up to 50mm/2inch diameter with 52cm/20inch hydraulic side-shift for medium and larger tractors from 25hp to 65hp engines with CAT I. / Cat. II 3-point hitches, working width is from 1350mm/53inch to 1950mm/75inch. Comer Transmission. Nova MFZ flail mower use transmission from Comer Industries. Forged flail hammer. Nova MFZ is with forged and galvanized high performance hammer knives, each weight is 1500gr/3.3lbs. To ensure a perfect mowing result on grass, undergrowth and bushes and will shred branches of up to 50mm/2inch diameter effectively. This makes the Nova MFZ mowers the first choice for vineyard owners and fruit farmers. Rear tine for better mowing performance. 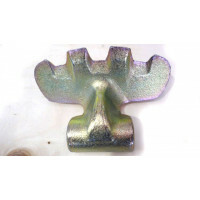 Part of the accessory for this mower are massive tines, that can be inserted in the rear of the mower housing. These tines will keep branches inside the mower until they have been shredded to a size small enough to fit in between the gaps between the tines. These tines can be removed for standard mowing. In case of mowing very high grass you have the option to open the rear cover of the housing to prevent congestions inside the mower. Heavy duty roller. The mowing height is adjusted by the heavy, ball-bearing mounted self cleaning rear roller which is 5.3" diameter, to prevent the mower from cutting into the ground on bumpy surface. Heavy duty front safety flaps. The mower′s front is equipped with heavy duty safety flaps to prevent debris and stones being thrown out of the machine. Wooden packing box. The completely assembled machine is delivered in the massive Nova wooden boxes, to prevent scratch during transportation. Belt tension test window. Like all other Nova mowers, the MFZ series has an electronically balanced rotor shaft which is driven by 3 or 4 belts depending on the working width. Despite the high flail hammer knife weight of 1500gr/3.3lbs, this guarantees an almost 100% power transfer rate with virtually 0% belt slippage. The new Nova belt cover is unique in the MFZ mower class. 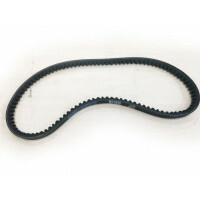 The correct belt tension can be checked within seconds without having to remove the belt cover. This makes service and maintenance a lot easier than before. Electronically balanced rotor. All the Nova mowers have an electronically balanced knife shaft which is driven by 3 or 4wide belts. The heavy free-wheel gear box runs in an oil bath, so the transmission oil has to be filled up before you first use the machine.